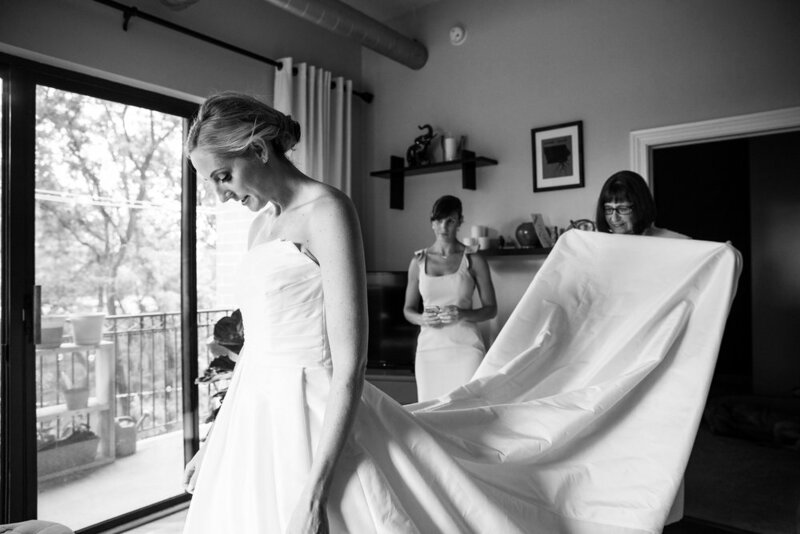 Jenn and Kristin’s September wedding at Greenhouse Loft! 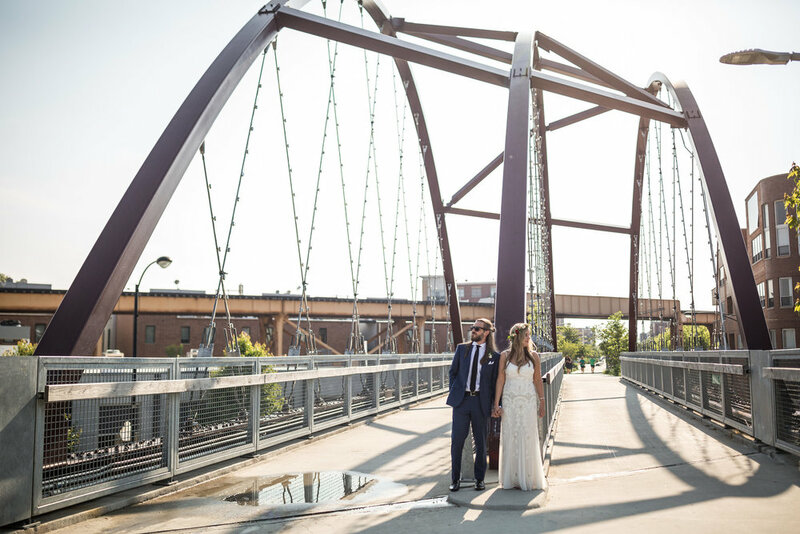 Amelia and Shane were married earlier this summer at Greenhouse Loft and we can’t stop looking at their photos! 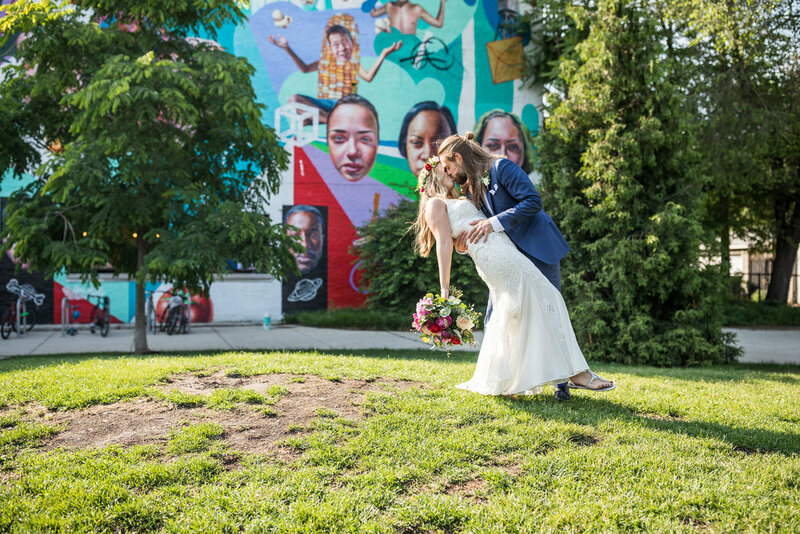 It was such a beautiful summer day in Chicago and you can almost feel the love between them! 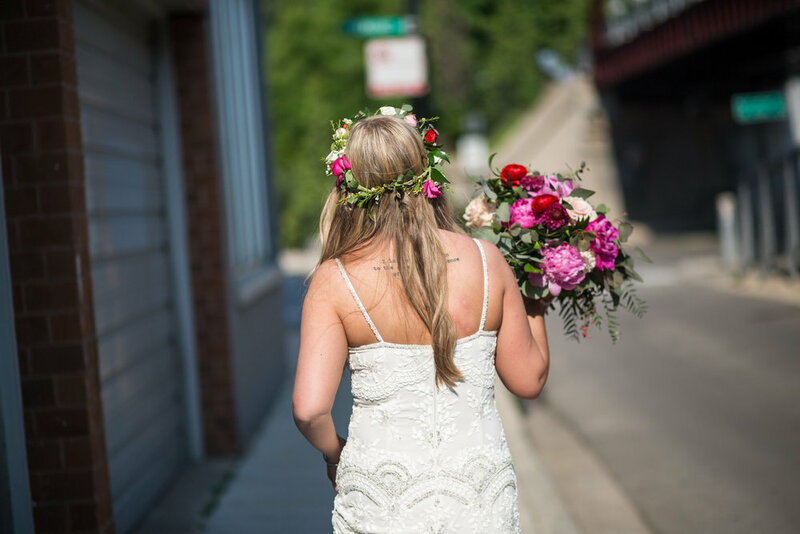 Amelia is such a stunning bride and she rocked that flower crown! 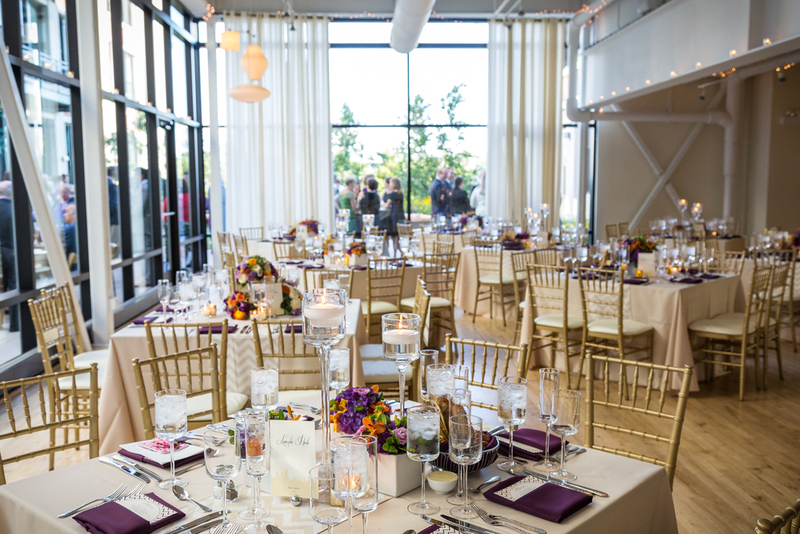 The couple and their wedding party got ready at the Le Méridien Chicago Oak Brook. 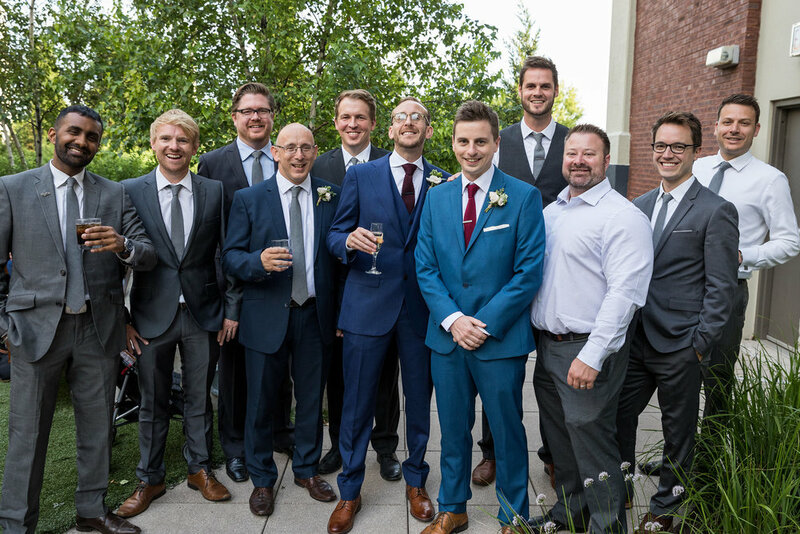 Our wedding was so great, we had so much friends and family that traveled from all over the place to come and celebrate with us. My matron of honor and her husband came from Norway to be with us! 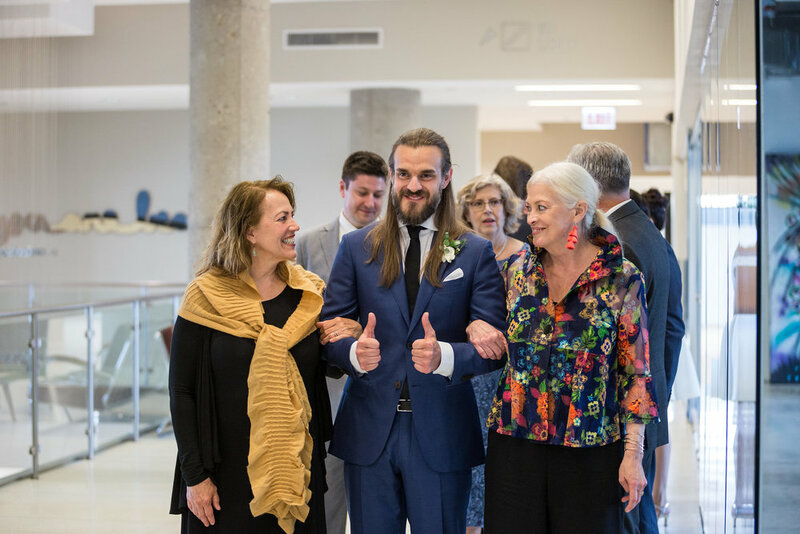 One of my favorite things was we did a hand-fasting during the ceremony, which is an ancient Celtic tradition of "tying the knot". Neither of us are religious but we wanted something old and meaningful and so we thought it was perfect. Congratulations again, Amelia & Shane! Congratulations on getting engaged! 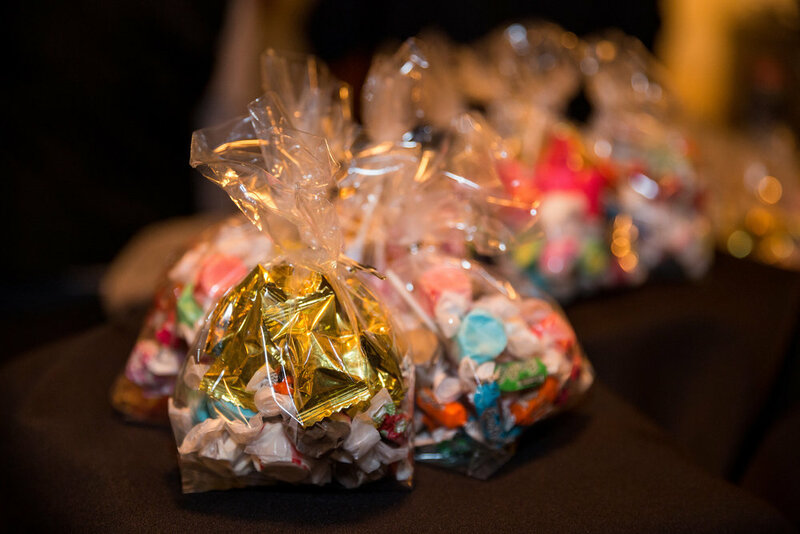 Planning a wedding can be one of the most fun and rewarding experiences in your life! 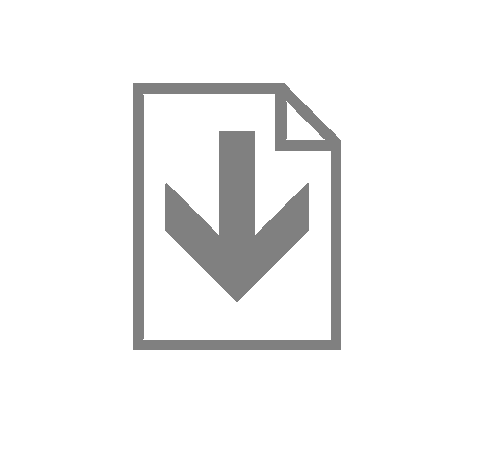 Once the question is popped, you (or your fiancé) will immediately start thinking details…who, what, when, where… you get the picture! 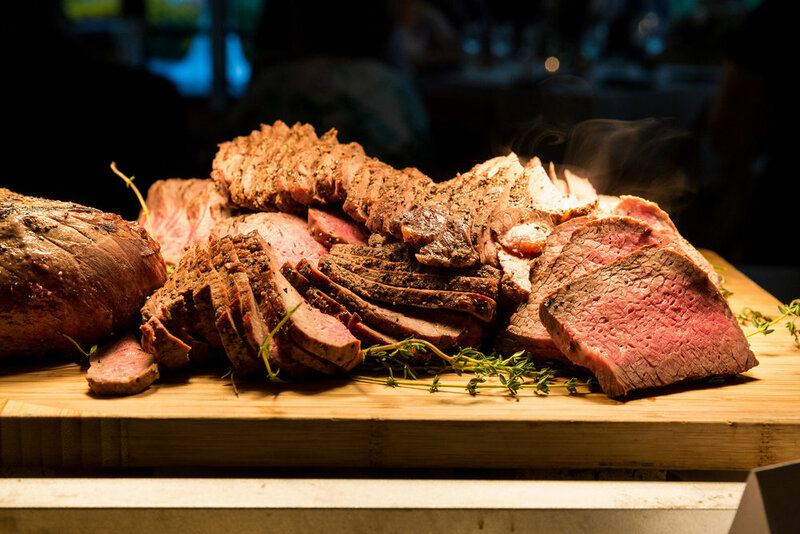 As you’re thinking through the details, there are some seemingly obvious things that you will need to consider; location, price, season, DJ or band, chicken or fish… you will be making many decisions in the coming months. One important choice you will make early in the process is the wedding date. You may have that special date in mind or you can let your favorite venue’s availability decide for you. 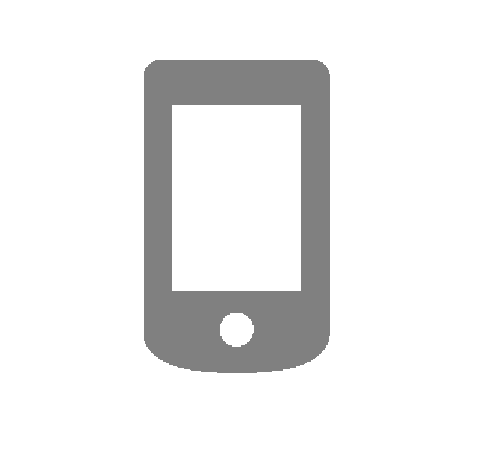 Many venues in Chicago book up well over a year in advance, so you may have to be patient! However, ask any couple who has planned a wedding, the engagement period goes by very fast, so don’t feel so bad about having to plan your wedding 15+ months in advance. At Greenhouse Loft, we post our availability calendar on our website to make it easier for couples to see their options. While certain dates seem obvious to avoid, in Chicago, it may be beneficial for you to do a little more research into the big events that happen in and around the city during the summer months. If you share your wedding date with a big convention, it might affect the availability of hotel blocks for your guests. Here are some yearly events that you may want to be aware of as you’re choosing your wedding date. 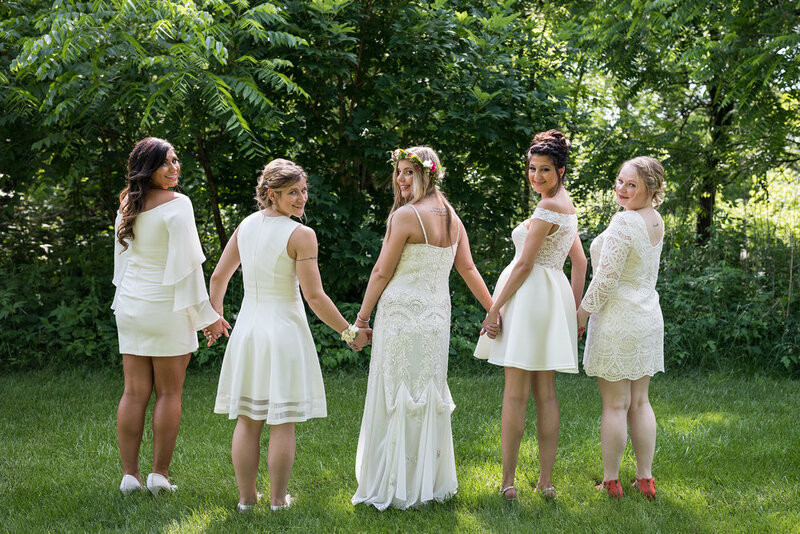 May kicks off those warm days of summer and is a very popular month to get hitched. May also holds the National Restaurant Association Show where over 70,000 people attend! During the first week of June, the ASCO annual meeting is held at various locations in Chicago and brings in about 35,000 attendees. NeoCon®, while it only lasts 3 days and is typically during the weekdays, in 2018 they expect 40,000 attendees. The Taste of Chicago is a summer staple around here. Following Independence Day, part of the downtown area is taken over by one of the largest food festivals in the city. Lollapalooza is a huge music festival. It sells out each year and brings massive crowds to the city. It is now a 4 day festival typically in the first week of the month. Don’t forget about the Air & Water Show toward the end of the month! Just under 100,000 people come to the IMTS Conference in mid-September. 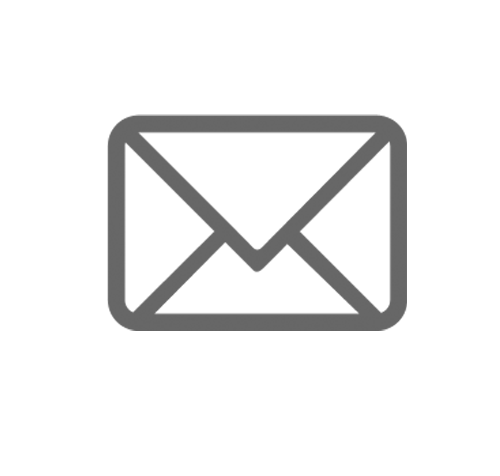 Late September brings another 20,000 to the GRAPH EXPO®. Over 150,000 people decide to lace up their running shoes for a 26.2 mile run. 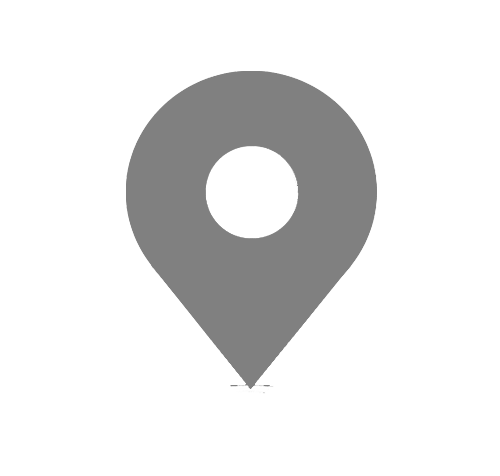 This event will not only affect your hotels, due to the sprawling street closures, getting from one part of the city to another can be very difficult. You might have some marathoners in the background of your off-site photos if you’re taking pictures downtown. The PACK EXPO, ACR/ARHP Meeting and the Ophthalmology meetings close out the rest of October. Chicago is a popular city and let’s face it, it is beautiful in the summer months! It’s no wonder that our convention centers attract such big events each year. The summer festivals are a part of why we love this city! Don’t let these popular festivals and conventions deter you from your ultimate wedding date, but maybe check in with hotels before your put down a non-refundable deposit. 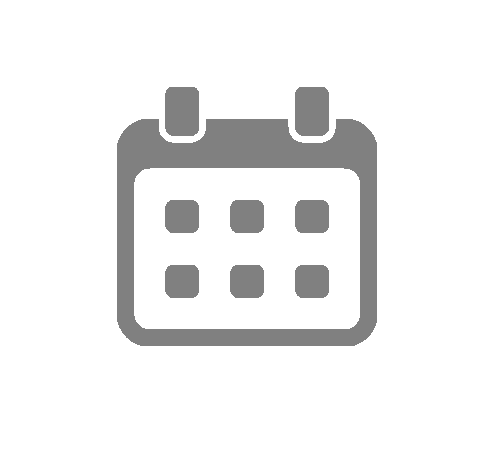 Email us if you're looking for more information about Greenhouse Loft! 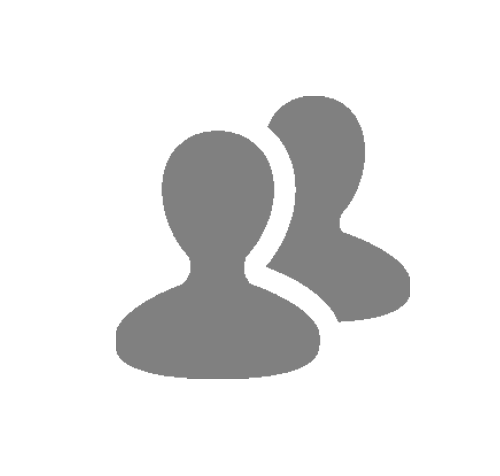 * events mentioned are just some of the many events that happen in Chicago. Check Choose Chicago for a more detailed list. It was such a lovely July day for Ching + Patrick's wedding. Read on for a little bit about their day in their own words & to oooh and ahhh at all the elegant details. We took a lot of great photos around Millennium Park before heading back to Greenhouse Loft. 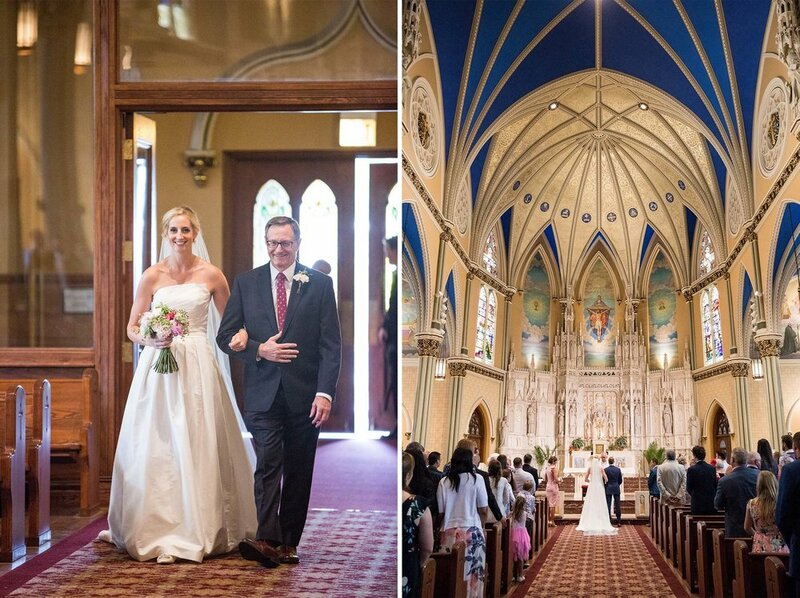 A great thing about getting married in Chicago is that you and your wedding party have so many gorgeous photo locations to choose from! The evening was perfect for an outdoor cocktail hour and summery signature cocktails! My eyes cracked open at 6:30am on June 12th, 2016 and I couldn’t believe it- today was my wedding day! The morning hours quickly passed as they were filled with laughter, excitement, and preparations. Before I knew it, we were off to take pictures on our way to the church. The weather outside was perfect- beautiful and sunny with a cool breeze in the air. I just couldn’t wait to see my future husband and love of my life! 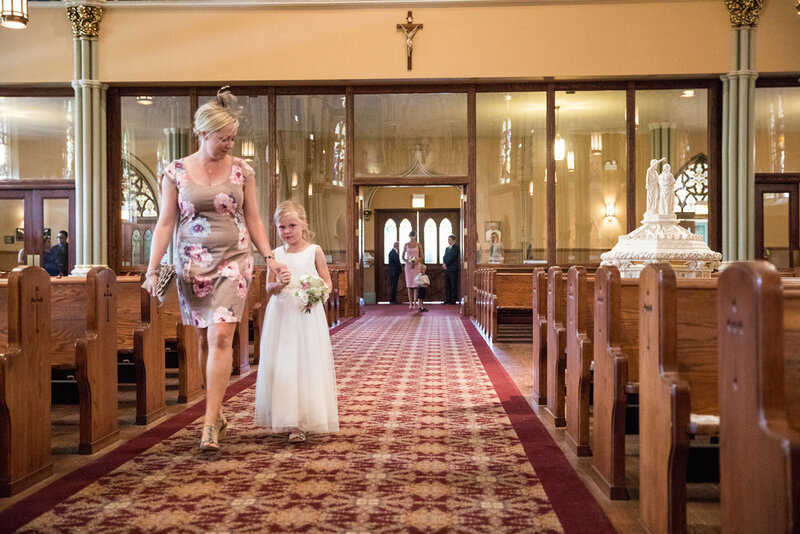 Once we arrived at the church, everything became a blur of overwhelmingly happy emotions. 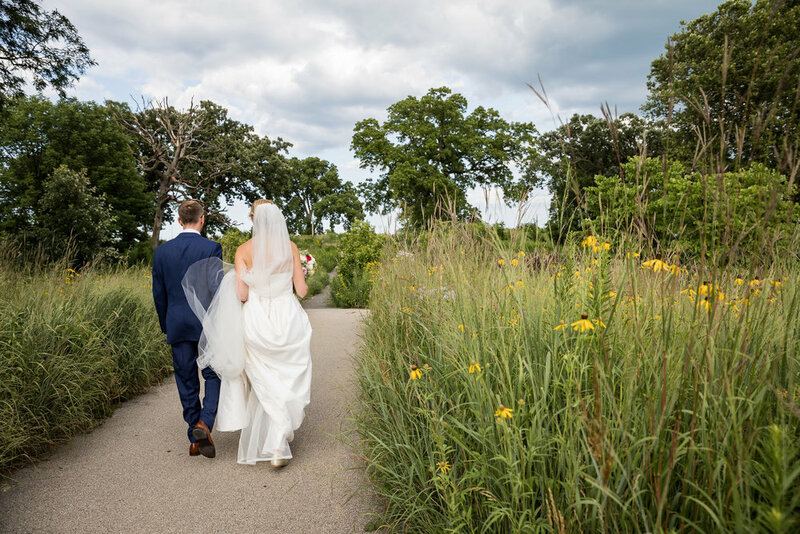 The ceremony was short and sweet with a few personal touches; the pictures at Lincoln Park were bound to be beautiful with our location, weather, the lovely faces of our friends, and very gifted photographers. 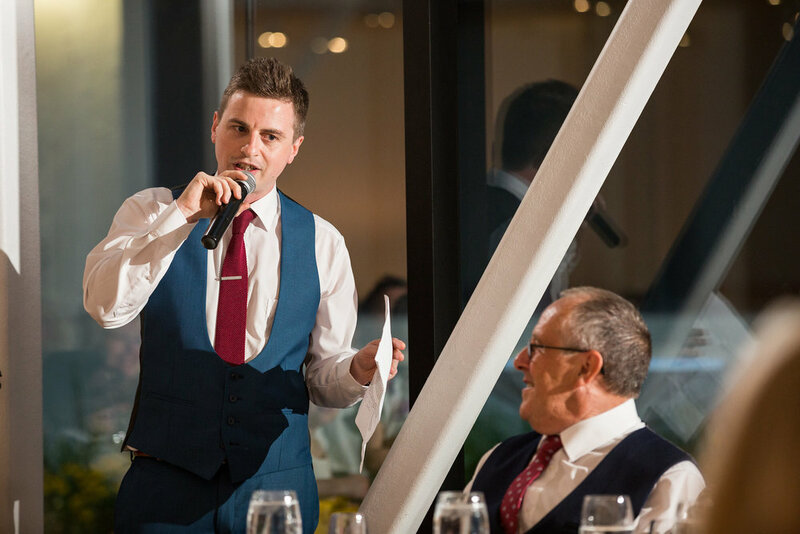 We walked into the reception to see our ideas displayed perfectly through the hands of amazing staff, and the rest of the night felt like a constant flow of love and support from people we treasure. It is truly a day we will remember forever. Melissa and Taylor were such a kind and loving couple to work with! The details of their July 11th wedding were planned out perfectly. Even when it sprinkled the day of their wedding they walked into the space glowing and smiling taking it all in stride and enjoying every moment. 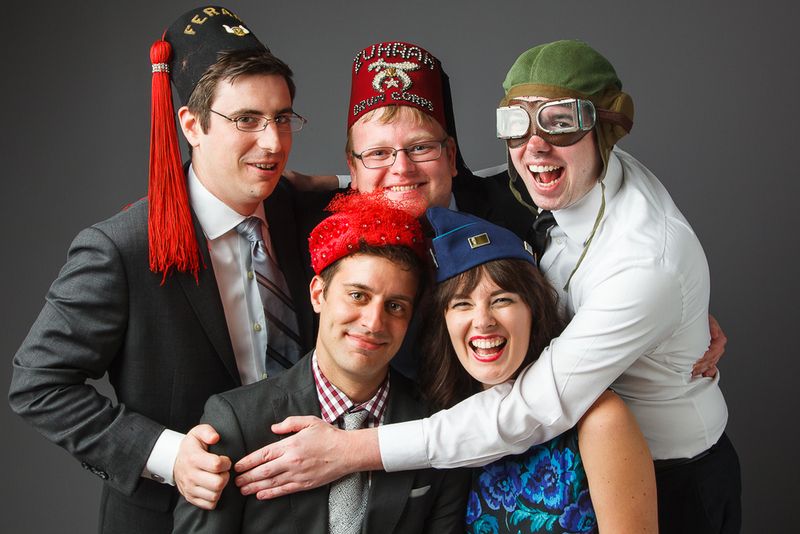 We were so happy they chose to have their family and friends enjoy the Ultimate Photobooth! 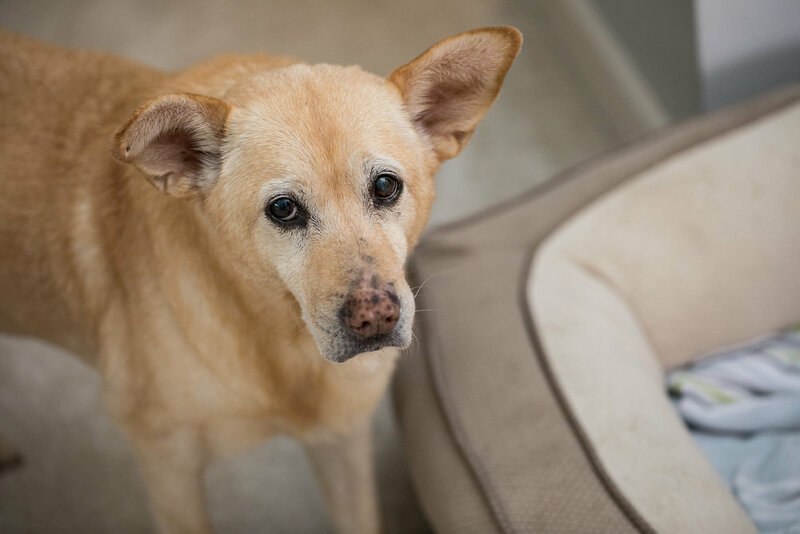 See below for some of their favorite shots and their thoughts on the day! 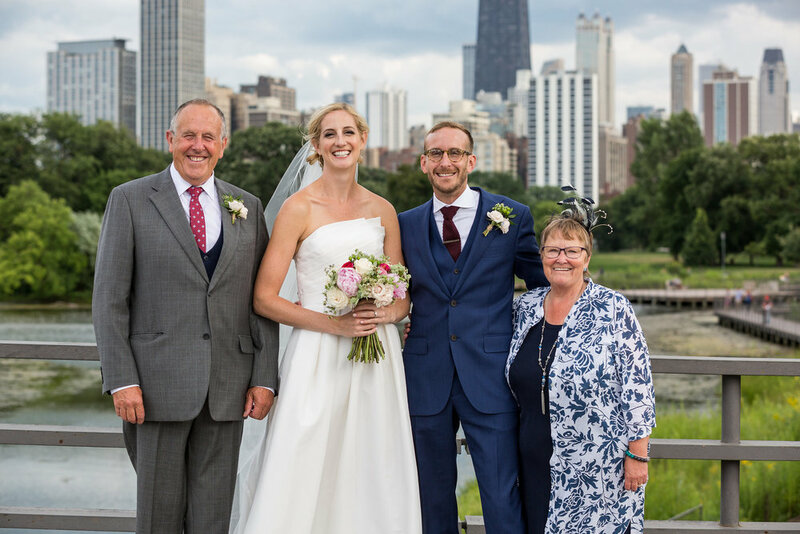 "Melissa and I are both Chicago transplants within the last several years, but have quickly come to love this city and call Chicago our home. We both grew up in different parts of the country and have family and friends from both coasts, and frankly, all over the world. Given we knew we would have so many out of town guests, we knew we wanted our wedding to be a reflection of our home, but also of us. Greenhouse Loft provided the perfect canvas to showcase the best of both. In fact, it was a very quick decision for us. I proposed to Melissa on the last night of our winter vacation, we flew home the next day (Sunday), and by the following Monday, we had toured and booked the venue!" 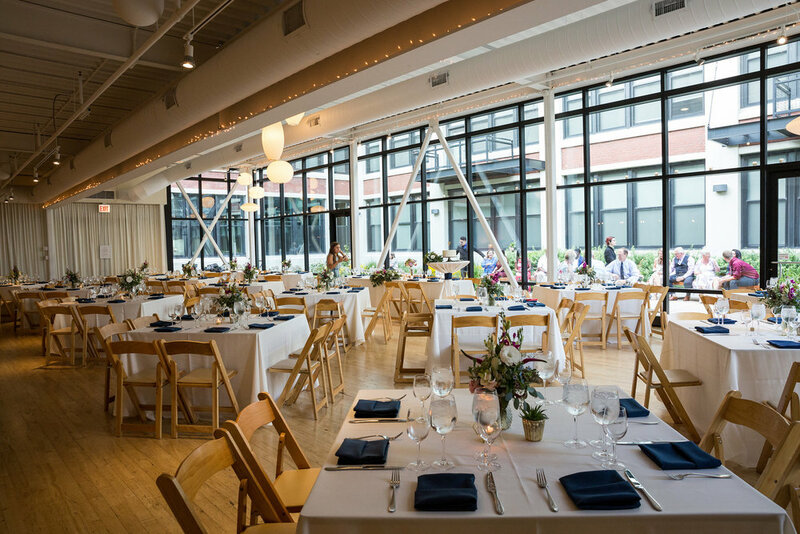 "Jamie at GHL and our event vendors (Christen at Big Delicious Planet - Catering and Megan at Pistil & Vine - Florist) did an incredible job arranging the space for our wedding. 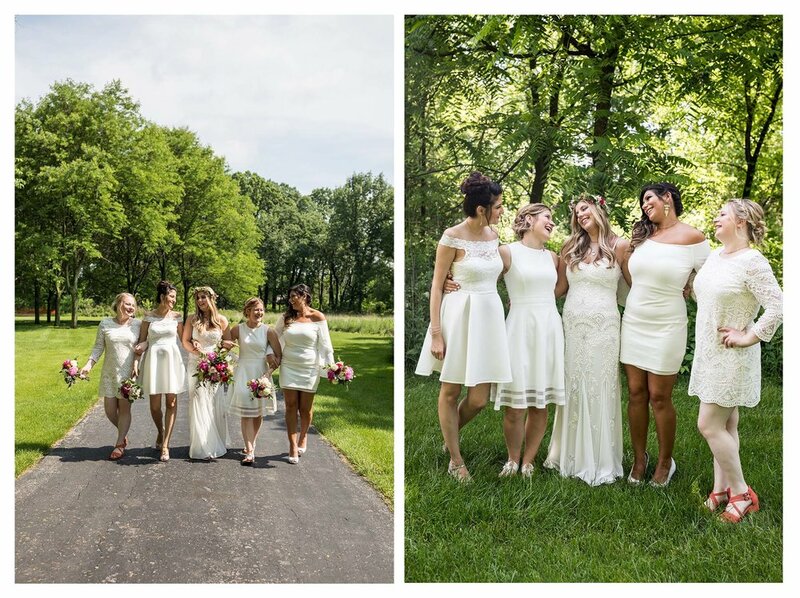 Melissa and I have a style that’s best described—in the word’s of Melissa—as “simple but striking.” The clean lines of GHL with the incredibly beautiful arrangements by Megan created an atmosphere that countless guests acknowledged as being the best wedding venue they have ever visited. 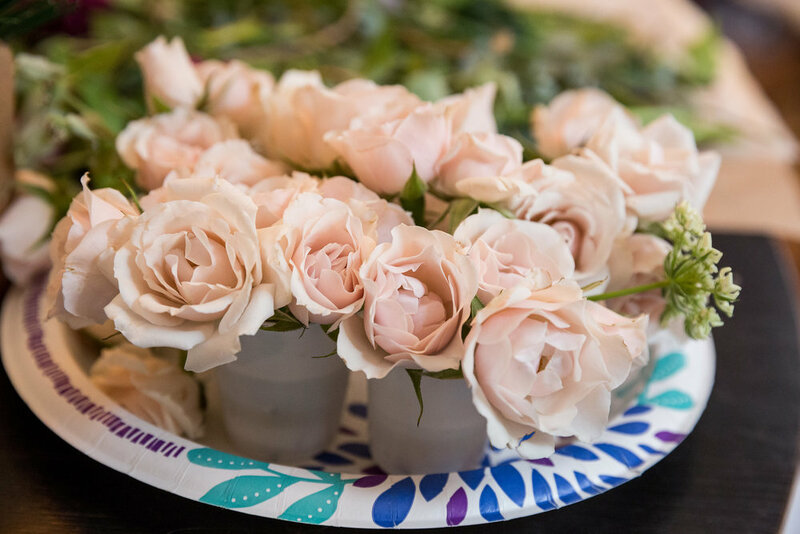 A few of our guests are now on a mission to actually recreate the floral centerpieces! The combination of our personalized ceremony officiated by Rev. Bruce Otto, the delicious food and drinks provided by Big Delicious Planet and the eclectic music by Emily from Toast & Jam created an experience that our guests continue to rave about. 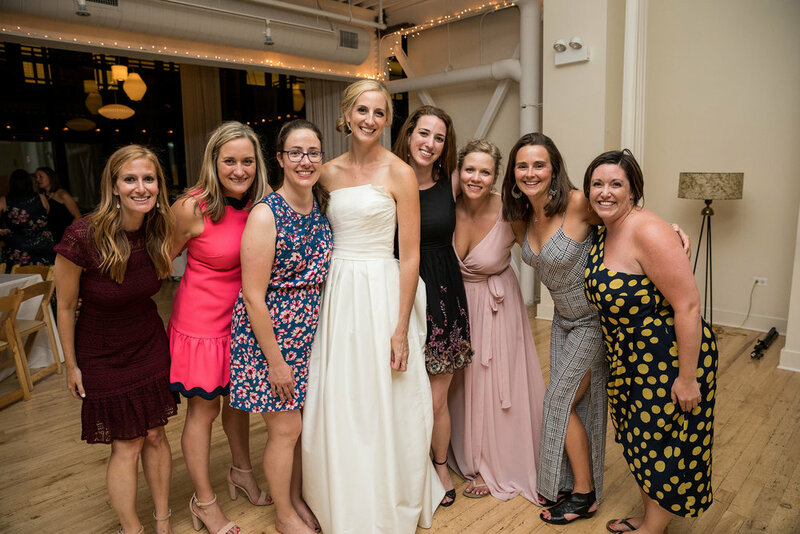 The wedding was truly a whirlwind, and we can’t wait to see the photos and video from Victoria Sprung and Mike Hendzel’s amazing teams to revisit all of the details. 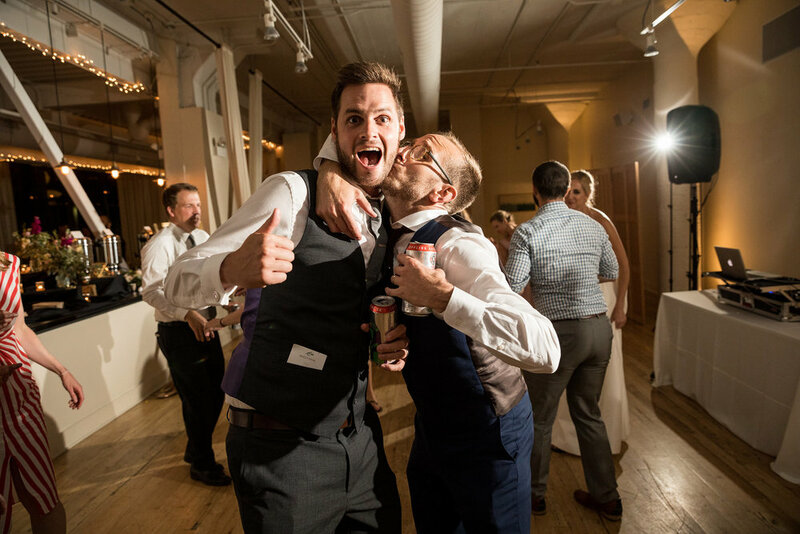 Steve’s Ultimate Photo Booth was a huge hit, and was a real bonus for our family and friends. 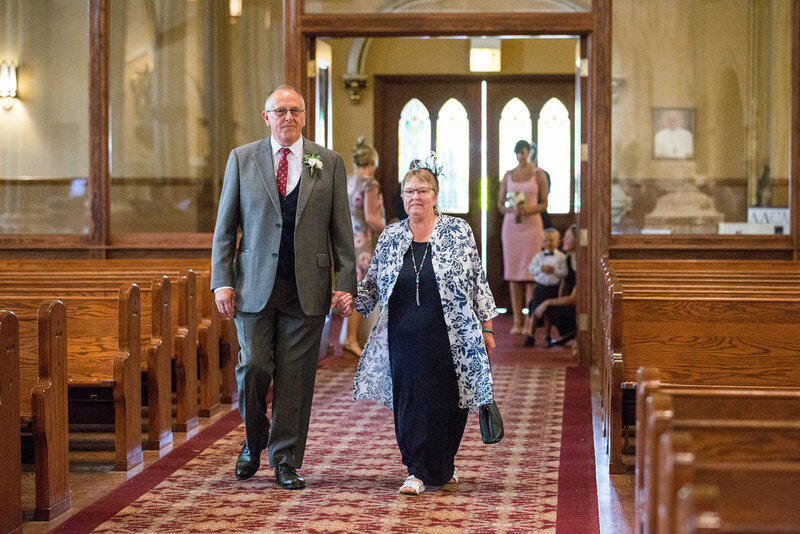 Steve's portraits are really tremendous, and we are so glad we were able to have someone as talented as him at the wedding." 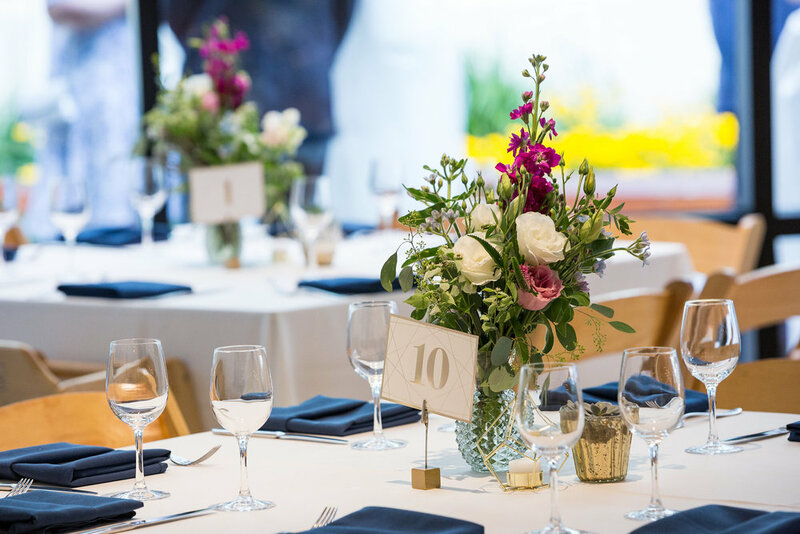 "Melissa and I set out to create a timeless event that captured the best of us and the best of our home, and without a doubt, the team at Greenhouse Loft and our team of vendors accomplished that goal." "P.S. 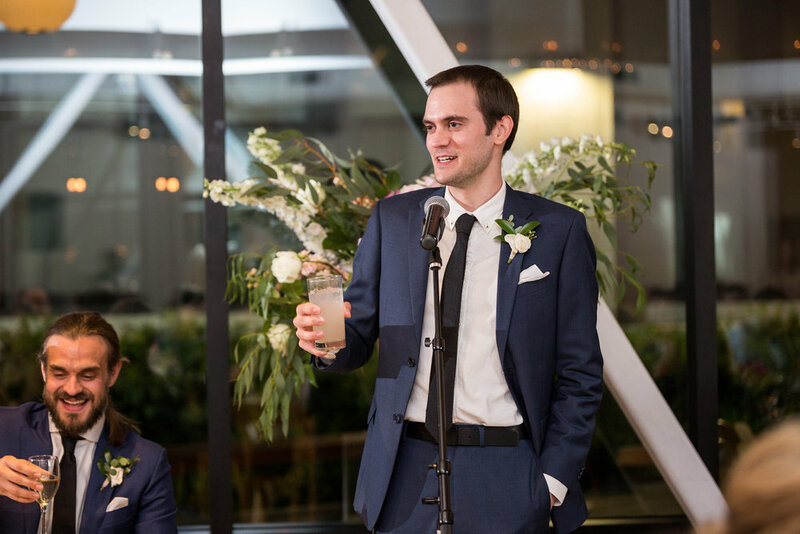 One of the main reasons we chose GHL was the ability to have an outdoor wedding and cocktail reception on site. Unfortunately, we had a bit of rain on our wedding day, forcing us to move the ceremony indoors. 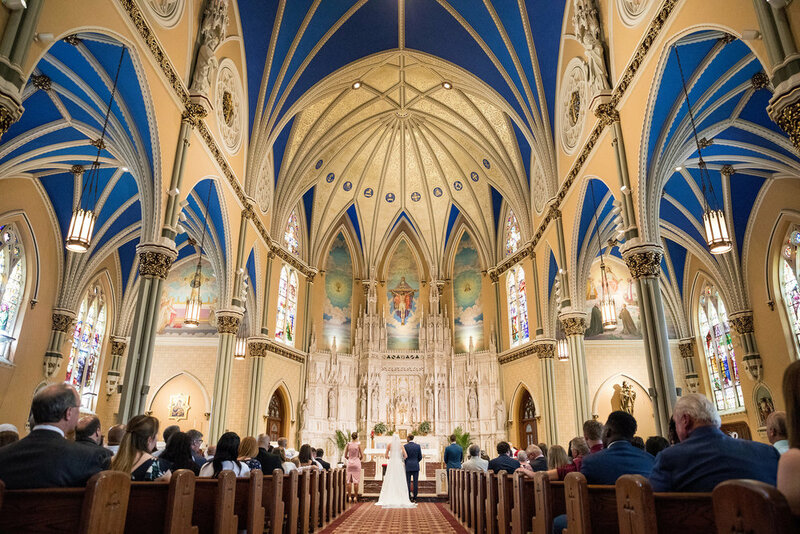 While we had a lot of trepidation about this happening, we were amazed with how beautiful the space was inside for the ceremony and how seamless the event was moving from ceremony, cocktail reception to dinner and dancing. 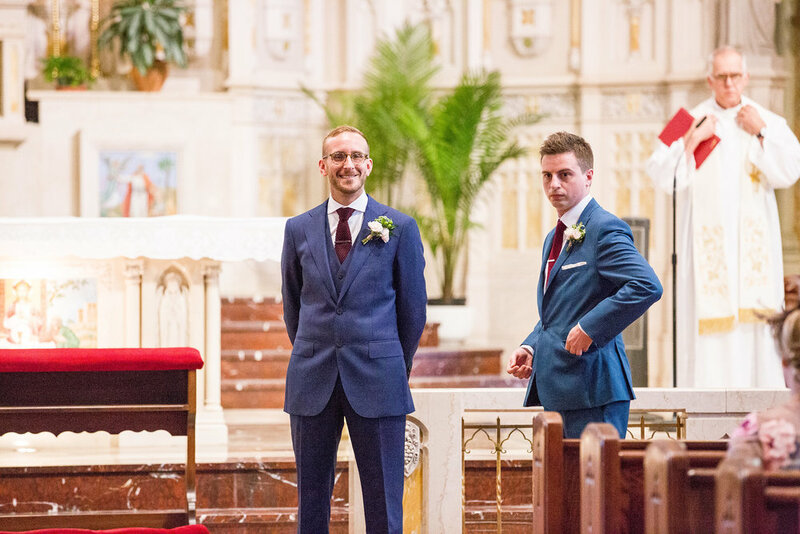 In fact, it was in a way fortunate as (1) it’s good luck if it rains on your wedding day and (2) it was so hot outside that I believe everyone appreciated the air conditioning!" We hope you enjoy Melissa and Taylor's portraits as much as we loved having them at Greenhouse Loft! Thanks to our awesome vendors for a great evening! 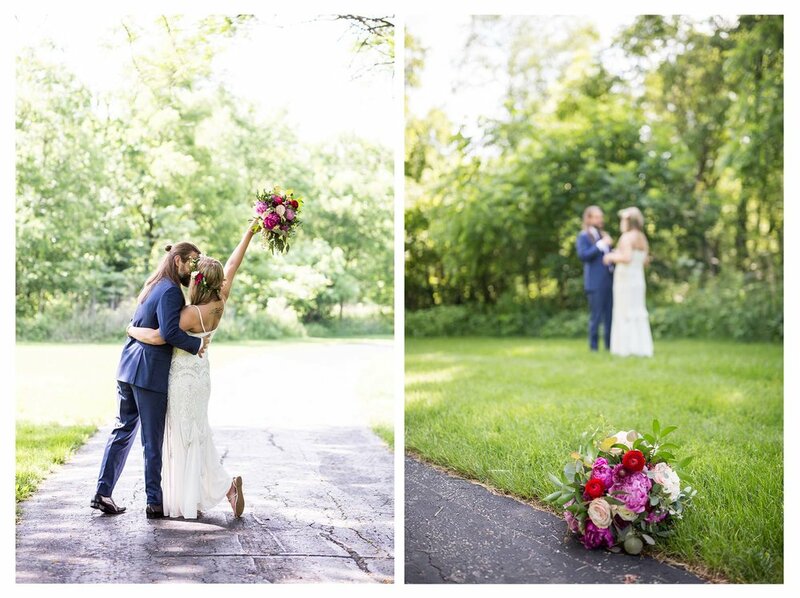 We were honored to photography Abigail and Scott's big day last June. 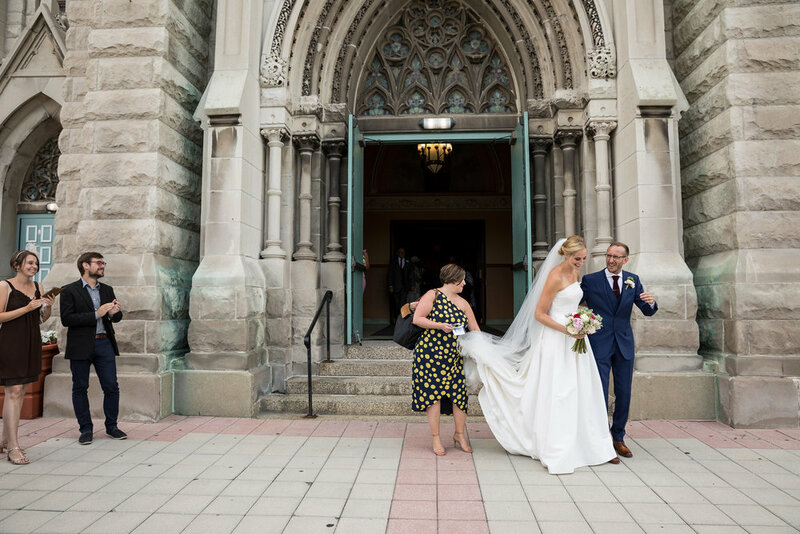 After getting ready at the Westin off of Michigan Avenue, the couple met outside the historic waterpower for their first look. The bridal party hit up the lake front and North Avenue beach for photos before the ceremony. 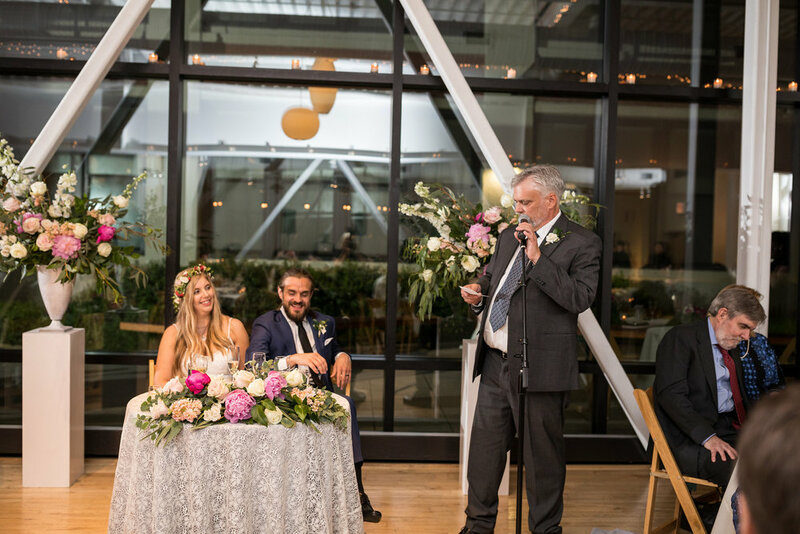 Back at Greenhouse Loft, Pollen Floral Design adorned the chuppah with leafy branches, and also created beautiful bouquets, arrangements, and vignettes with small vases using romantic seasonal blooms (peonies! ranunculus!). Many heartfelt speeches were shared, then the happy couple cut their wedding cake and took to the dance floor for their first dance as husband and wife. The dance floor was full all night long thanks to tunes from Style Matters and everyone paid a visit to Greenhouse Loft's Ultimate Photo booth for portraits with our vintage hats throughout the evening. 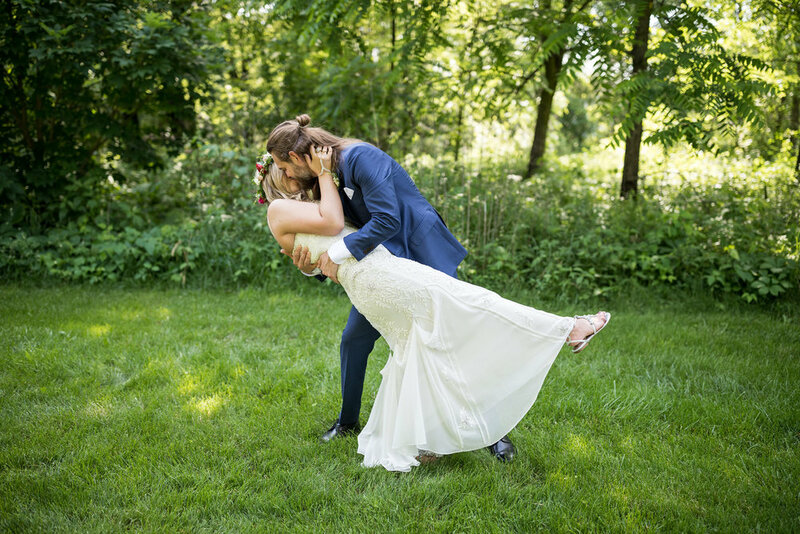 Enjoy some of our favorite moments from their beautiful wedding day! K.T. and Ankit were bursting with joy and positive energy on their wedding day last June. The happy couple was all smiles during their first look in California Park. They then took some photos around some of their favorite neighborhood spots, including a local pub with a great patio. Their heartfelt ceremony was held at Greenhouse Loft, followed by cocktail hour inside the garden. 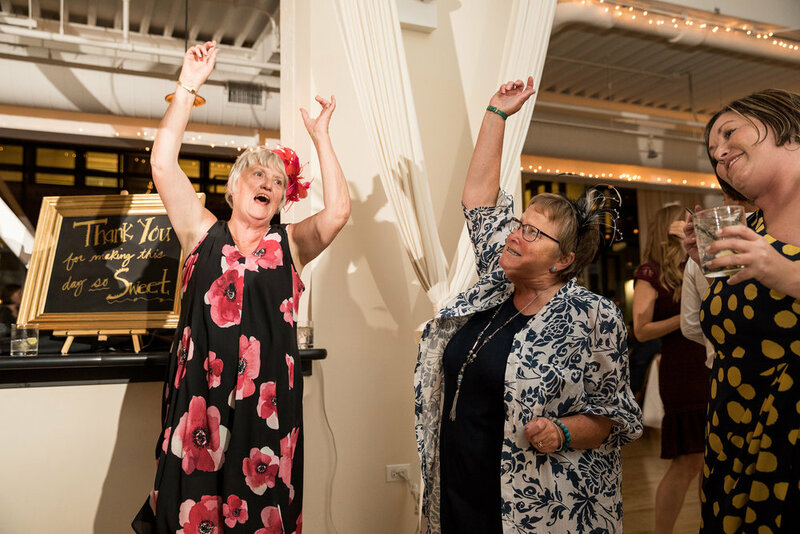 Guests enjoyed a delicious dinner catered by FIG and danced the night away thanks to great tunes provided by DJ Jennefa of Toast & Jam. 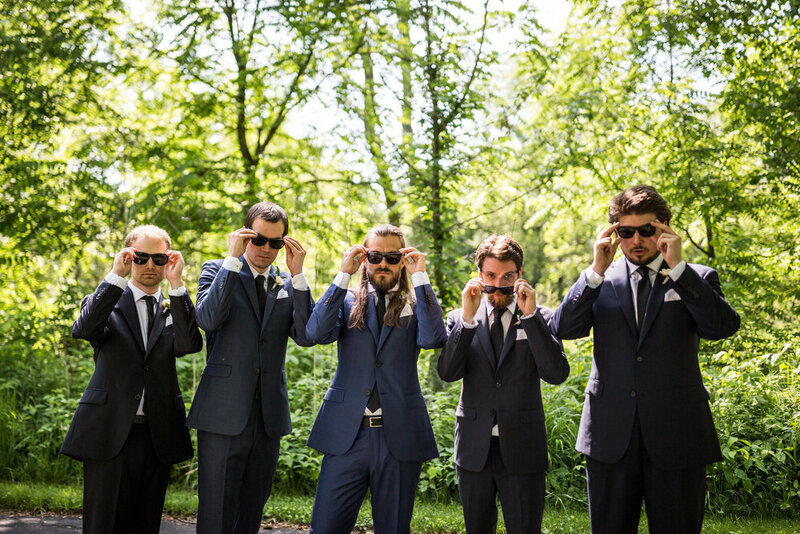 Check out a few of our favorite photos from their wedding day! Thank you to a wonderful team for helping make this such a beautiful celebration! Pat and Kim's Best Day Ever! 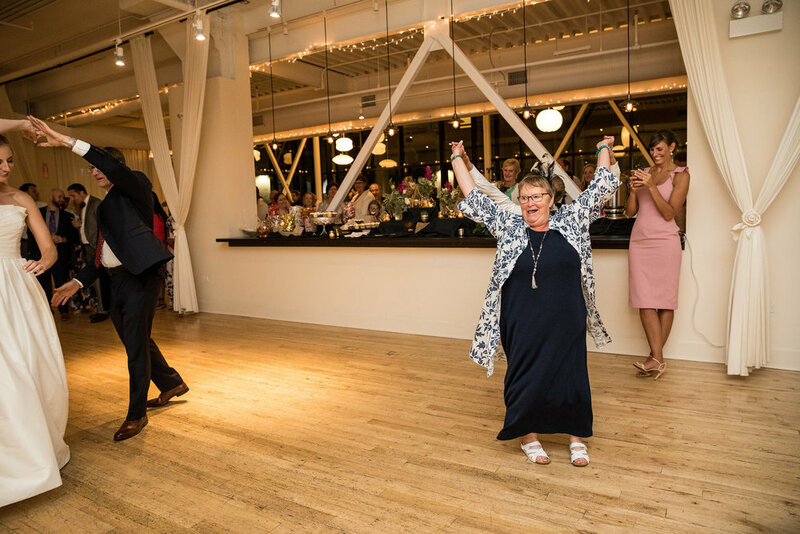 Kim and Pat had a gorgeous August wedding day and we were not only lucky enough to host their celebration at Greenhouse Loft, but also photograph all the special moments throughout the day! Pat and I were engaged for 18 months because we wanted time to prepare for our wedding. 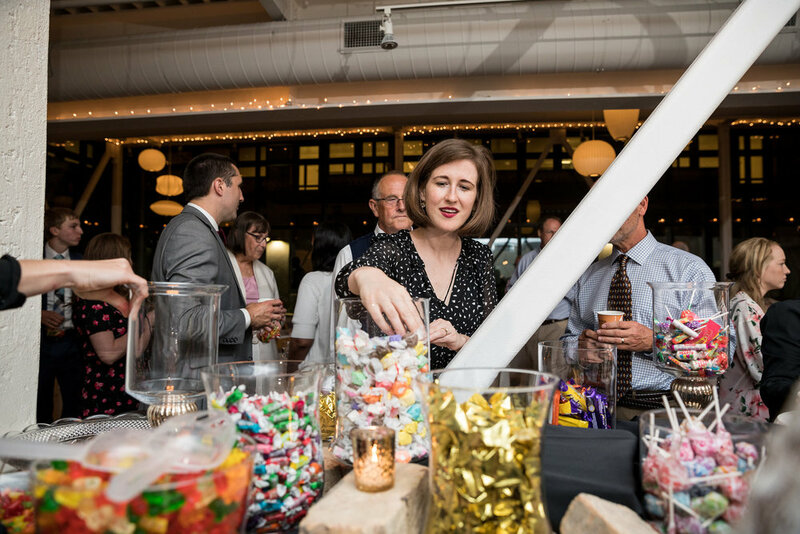 From the start we made our guests, a city venue, and the food a priority. 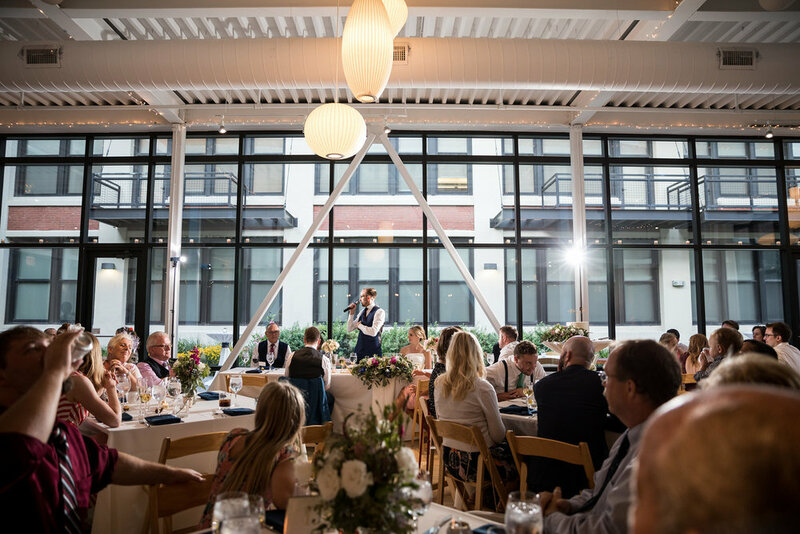 We wanted our guests to feel like they were dining out downtown on our wedding night and both Greenhouse Loft and Hearty Boys delivered! 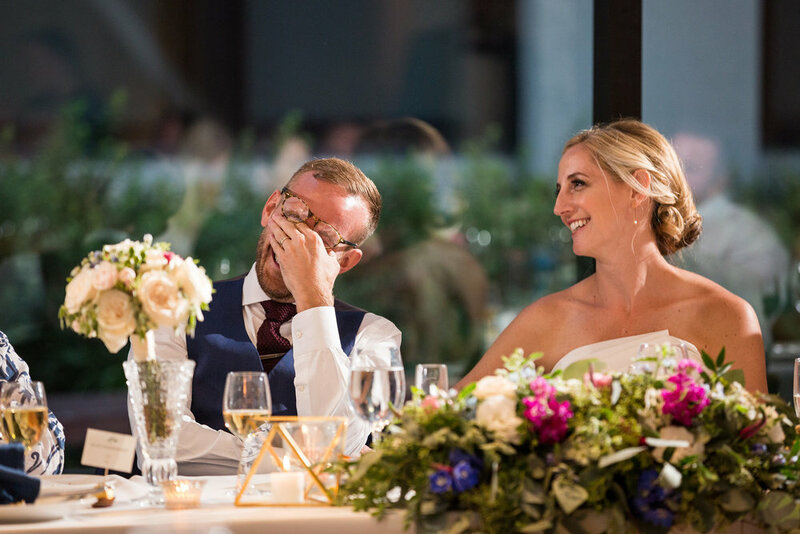 What I'll remember most from our wedding day was all the laughter. I remember being so nervous putting on the dress and going to meet Pat for the "first look" photos. But once we saw each other all the nerves melted away. The rest of the day was filled with joy and laughter, even during the ceremony. I think the space at the venue perfectly complemented the casual and soft vibe we were going for. Every choice we made was a reflection of us as a couple. Our cutting cake was from Table 52, the restaurant where we got engaged. Our cocktail hour featured two signature cocktails: his and hers favorites. Our favors were letterpress posters handmade by the bride with love song quotes. In the end, our day felt personal and special. We couldn't have recapped the day better ourselves. 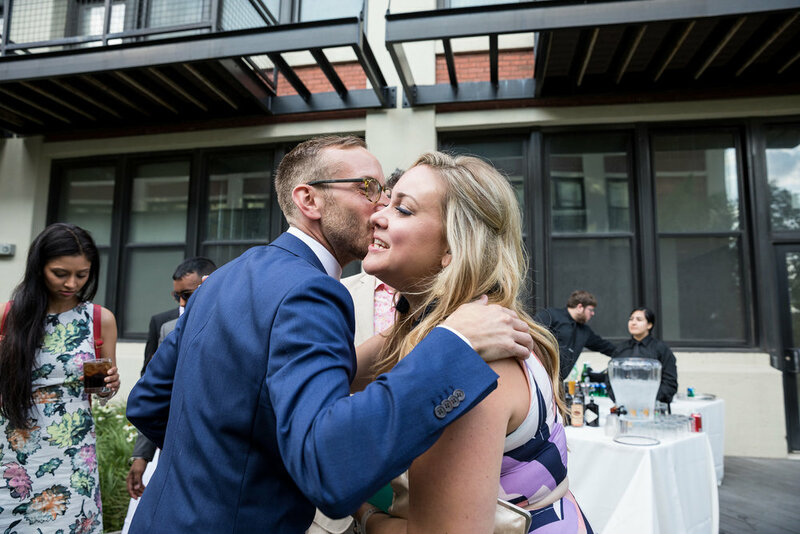 Cheers to these love birds, and all the couples we get to work with - past, present, and future. 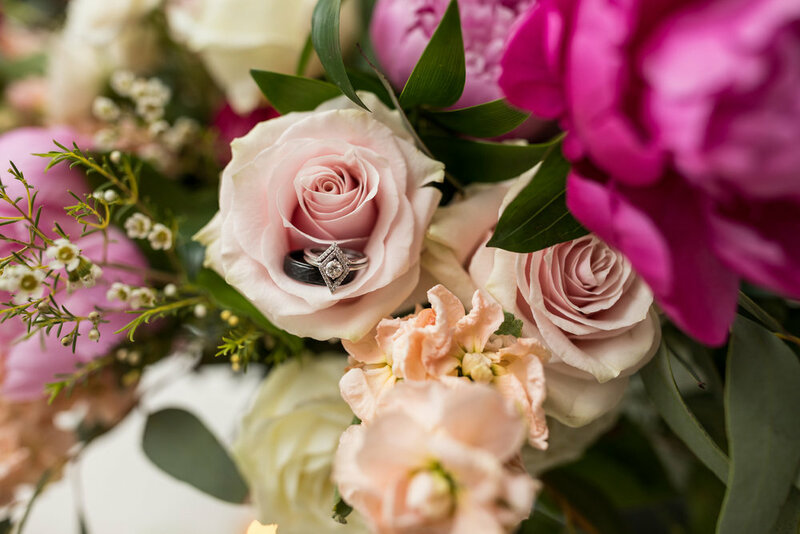 We love being a part of your big day! 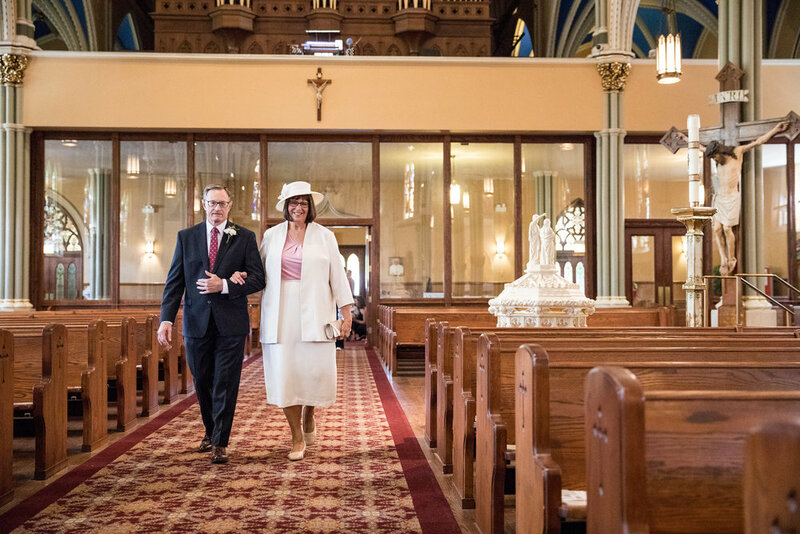 Check out some of our favorite photos from Pat and Kim's wedding below. The bride designed her entire invitation suite through her design business, Kim Designs! Kim and Pat got ready separately at the Palmer House Hilton Hotel. Then the couple had their first look in the hotel's grand lobby. Their sweet pup even joined in for some photos! 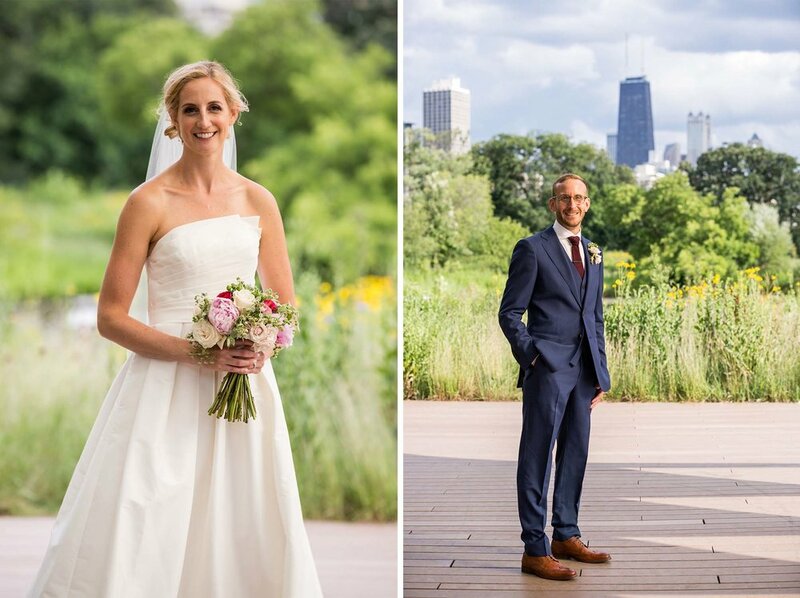 After the first look, the wedding party left the hotel for photos in Millennium Park's Lurie Garden and outside of the Art Institute of Chicago. We love how picturesque this area is - joining together nature elements with beautiful Chicago architecture in the backdrop. 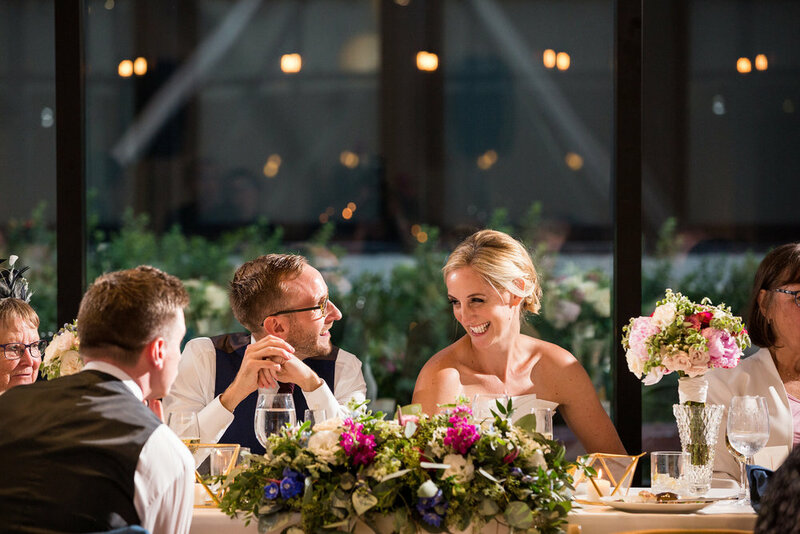 The ceremony was held at Greenhouse Loft, on the glasshouse side of the room with a lush garden backdrop. After enjoying cocktail hour in the garden, guests came back into the loft for dinner. The head table was set up so that bridal party spouses/significant others could sit across from their dates, leaving an open window for the bride and groom, of course! 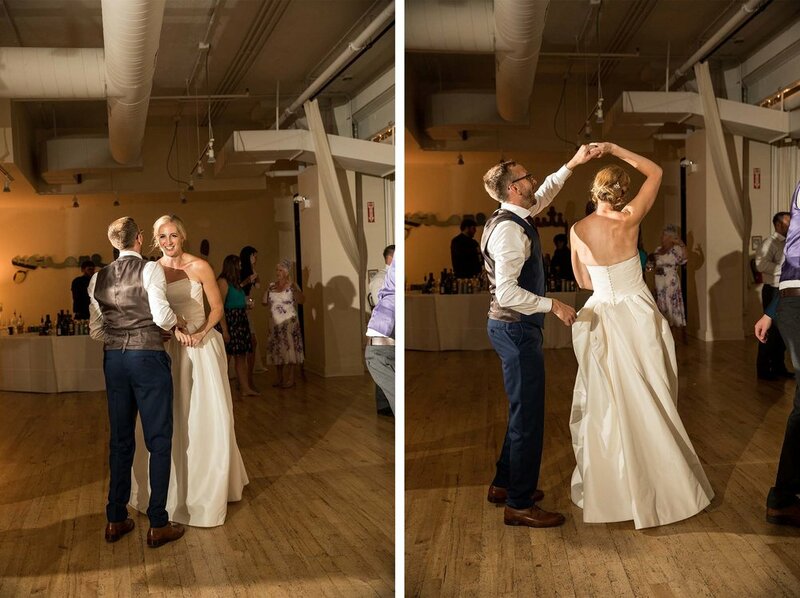 A lot of couples do this in our space and we love the set-up with the dance floor right in front of the head table. Kim screen printed lyrics from some of their favorite love songs as favors for guests. How cool is that? Then the bride and groom were toasted by their mothers before dinner began. The couple cut a cake from Table 52, with a fun cake topper, keeping with their 'Best Day Ever' theme. The bridal party sent silver streamers onto the couple during their first dance! When the hula hoops made an appearance on the dance floor, both adults and chidden joined in the fun. Thank you to a great team of vendors who helped Kim and Pat have their Best Day Ever! 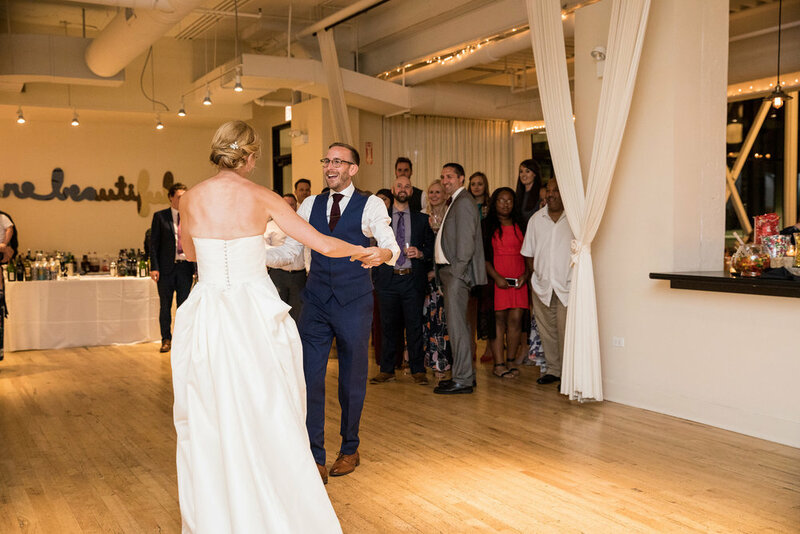 On a cold, snowy Chicago day, nothing cheers us up more than looking back at photos from one of our favorite weddings hosted at Greenhouse Loft this past summer. 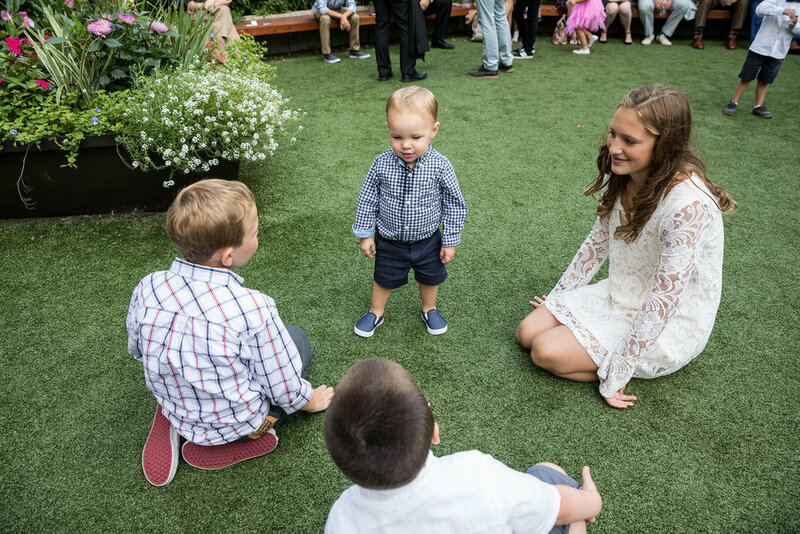 There are so many little details that made Diane and Melinda's wedding so special, but one of our favorite things about this couple was how thoughtful they were about including their two children and and friend's kids in the festivities. It was truly a family-centric celebration and we couldn't have been more delighted to capture all the special moments throughout the day! 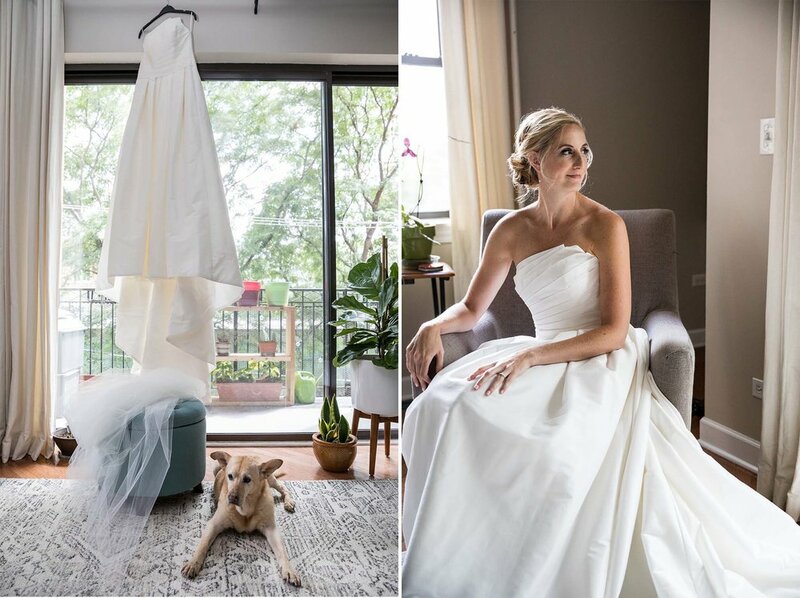 The brides began their day getting ready in separate rooms at the Trump Hotel, followed by a memorable first look on the terrace of the hotel overlooking the Chicago River. 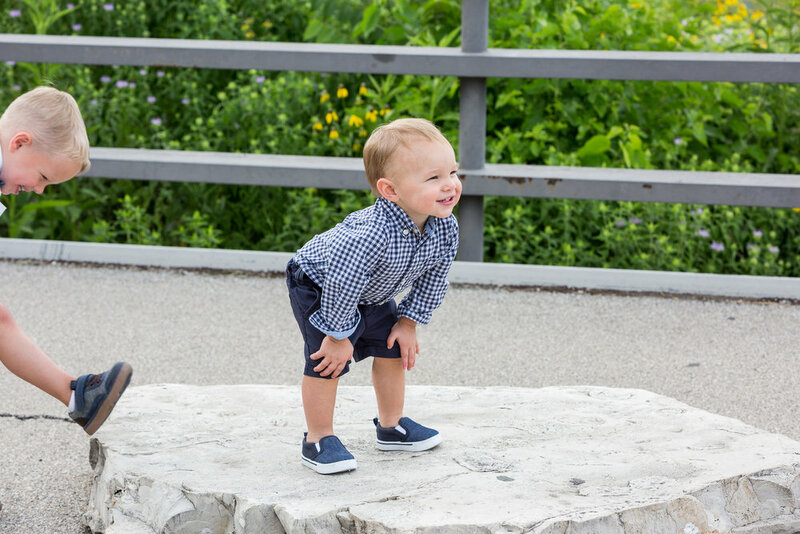 Then Diane and Melinda headed to the Nature Boardwalk in Lincoln Park to get some photos near the picturesque honeycomb structure with their two children, Jackson and Ella, and their Matrons of Honor. 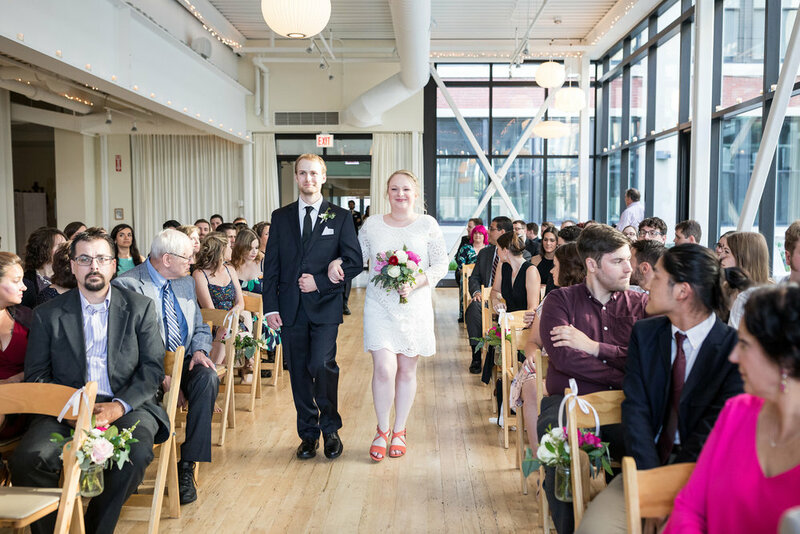 The whole family was involved in the ceremony at Greenhouse Loft. 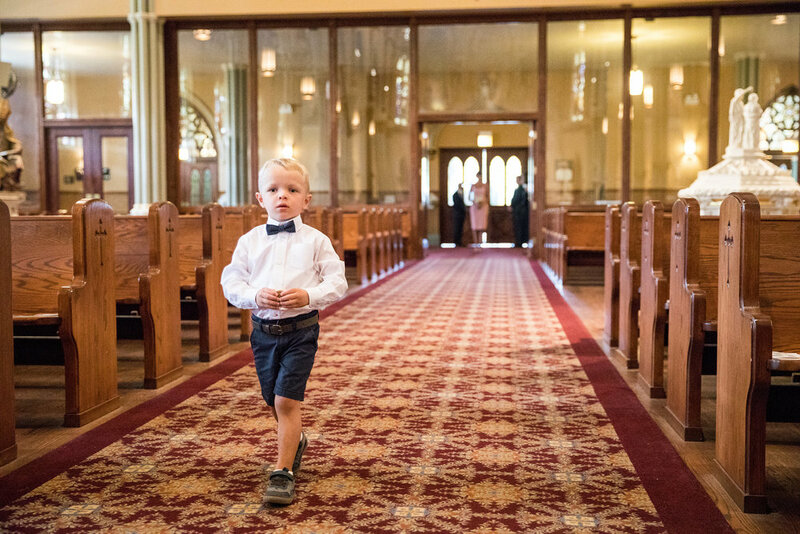 Their son, the ring bearer; their daughter, the flower girl. Diane and Melinda wed on the glasshouse side of our loft space, with a lush garden backdrop behind them. 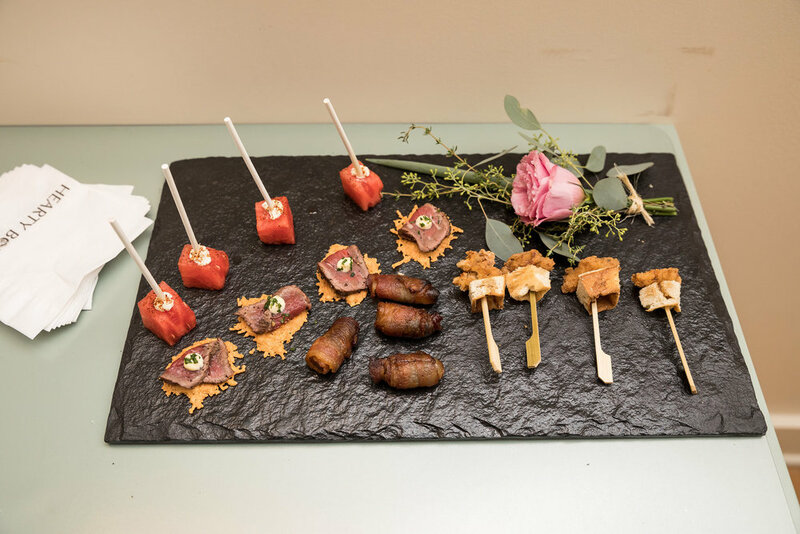 After the ceremony, guests enjoyed delicious appetizers and drinks prepared by Food For Thought. The brides even supplied some fun games to entrain the children during cocktail hour in the garden. From bags, to hula hoops, to giant jenga, the kids (and adults) had a blast playing together and building tall structures with the blocks! Meanwhile, the loft was transitioning over for dinner and dancing. 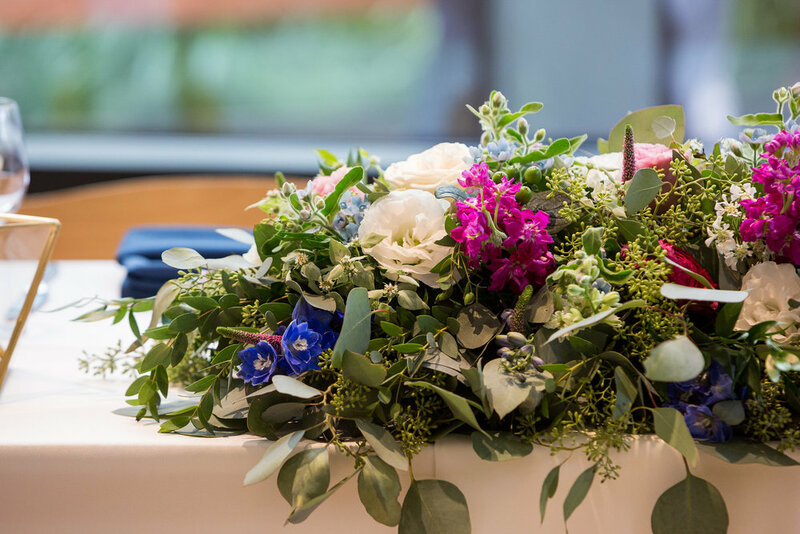 Bright florals by Exquisite Design made lovely focal points at each table. 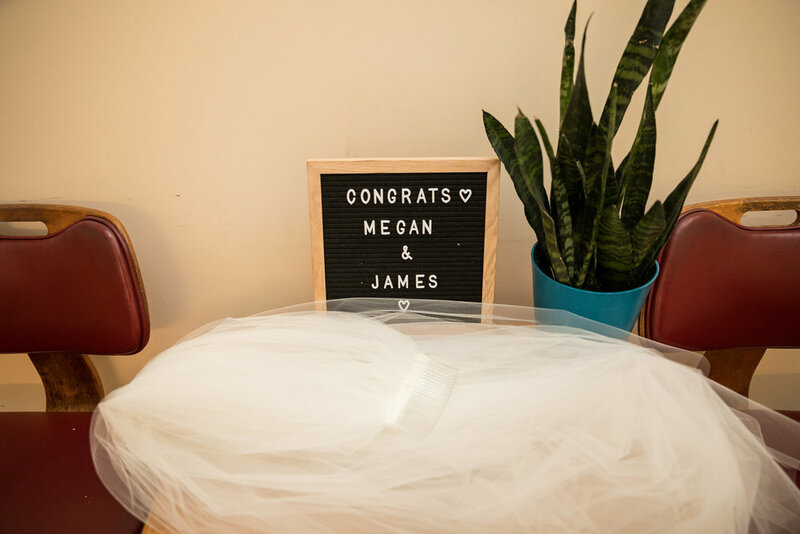 We loved the "Mrs." & "Mrs." signs on the back of the Bride's chairs, as well as the "Stop by" and "Say hi" message on the back of two other seats at their head table. Each adult place-setting had a glass of sparkling rose greeting them as they entered the room. And each children's place-setting came equipped with their own activity book and crayons to draw pictures. Among other drinks, the bartenders crafted two signature cocktails throughout the evening - the Berry Brunette and the Smashing Blonde! 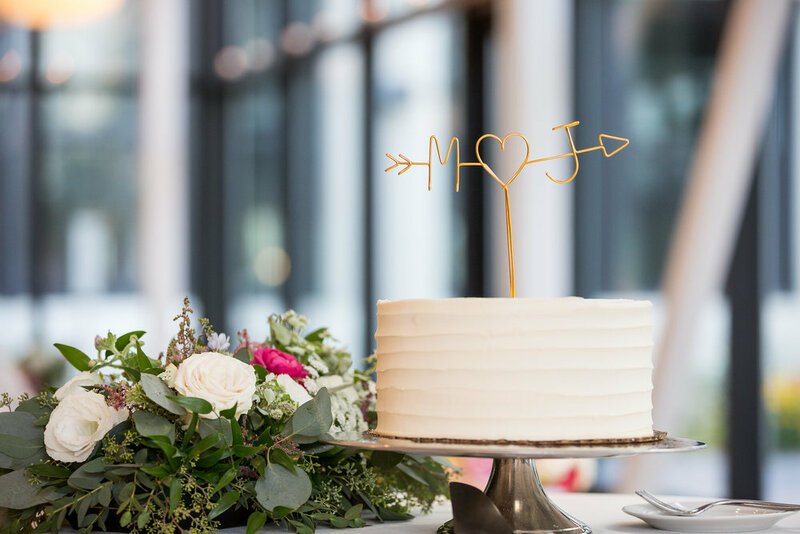 And we were swooning over their lovely cake from Alliance Bakery, adorned with ribbon, roses, succulents, and a romantic script cake topper. Diane and Melinda kicked off the reception by cutting into the cake. Then close friends and family members took turns toasting the lovely ladies of honor. 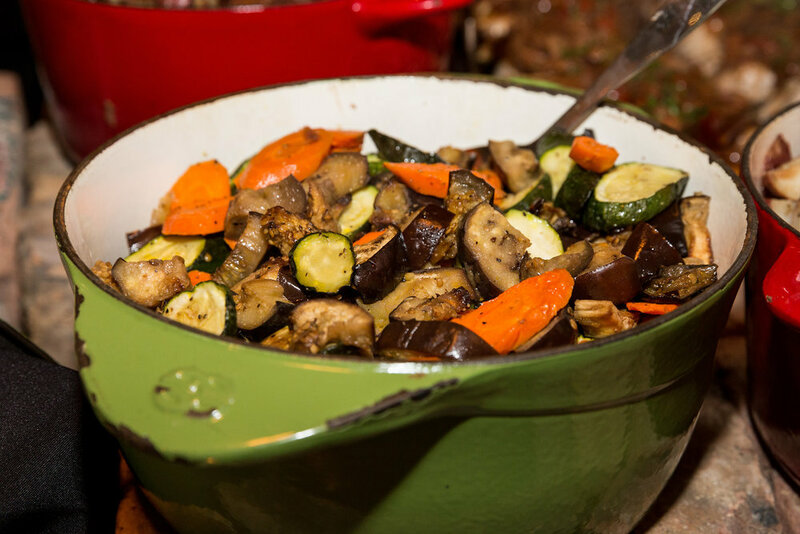 Guests enjoyed their choice of delicious chicken or fish entrees, made by Food For Thought. The brides took to their first dance after dinner, but it wasn't long before their daughter Ella joined in. Diane and Melinda whisked her up and twirled her around with them! 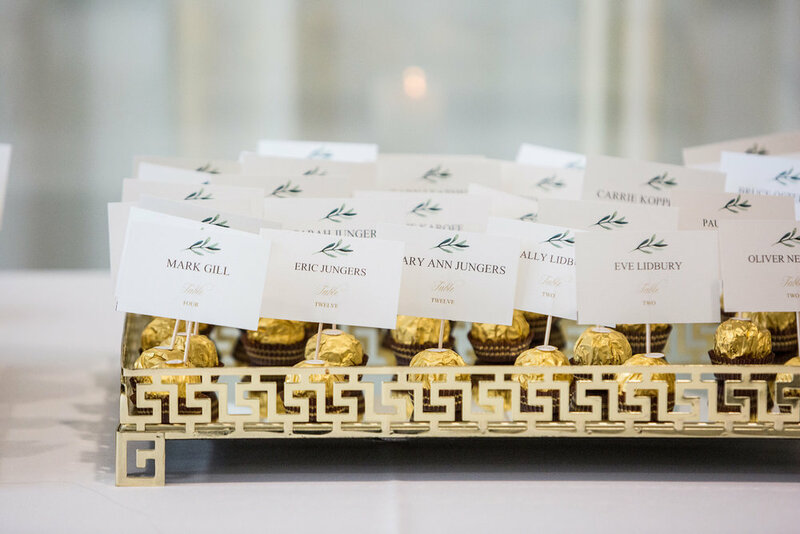 In addition to the wedding cake, Alliance Bakery made an impressive spread of macaroons, tarts, and other delicious treats - enough options to delight any sweet tooth! Even after dancing had begun, some of the children could often be found hula hooping in the garden. Throughout the remainder of the evening, guests also visited Greenhouse Loft's Ultimate Photo Booth to get their portraits taken by Steve Ewert. It was such a spirited crowd and we love how playful they were! What a special day. Thanks to an amazing team of vendors who executed everything flawlessly. Special thanks to Diane and Melinda for allowing us to film their wedding. 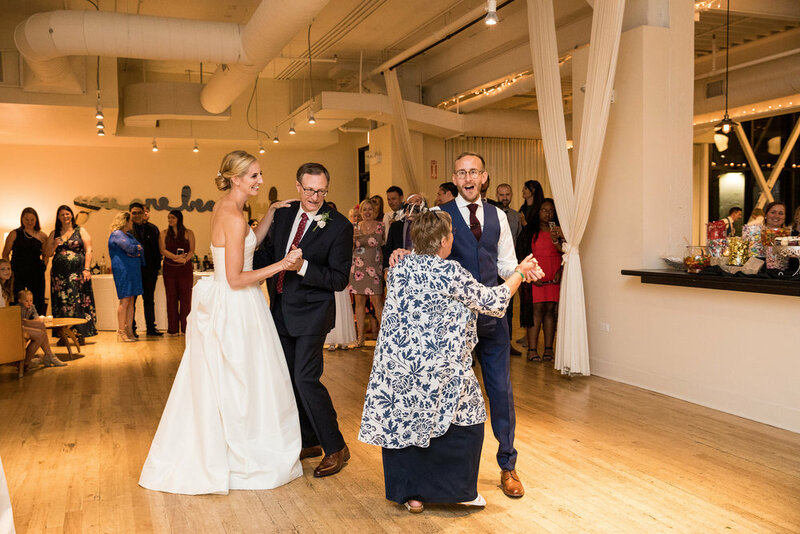 Mark Winters captured behind the scenes footage, as well as all of their special moments, so we could have a video that represents how our loft space can transition throughout a wedding day. Check it out! All our best wishes to Diane and Melinda as they celebrate their wedding with friends and family! 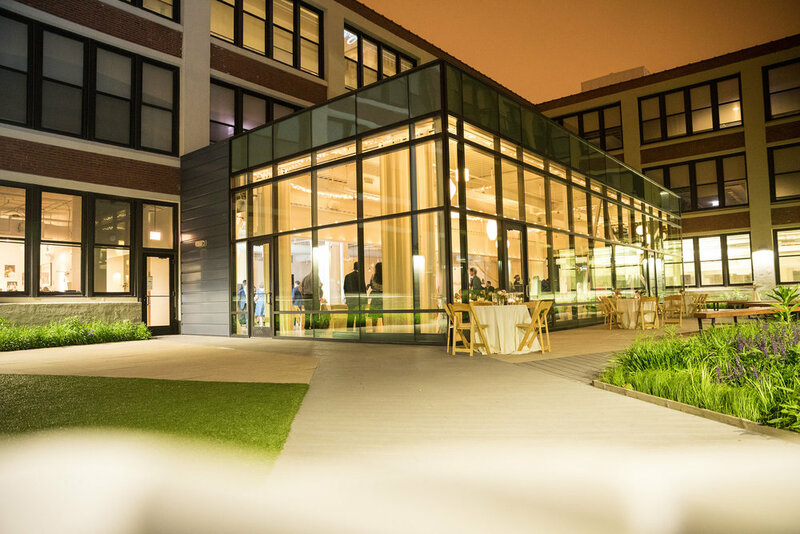 Thanks to Food For Thought, Toast & Jam, Exquisite Design Chicago, Alliance Bakery, and LOLA Event Productions for helping make this a wonderful night! Photography by Greenhouse Loft Photo (Steve Ewert, Jamie Davis, and Eric Davis). More photos and a video to come!